It is often stated that rangelands suffer from overgrazing and excess water extraction, but there is a lack of reliable historical data to support these claims. Data exists in well managed reserves such as the Dubai Desert Conservation Reserve (DDCR), but it is labour intensive and expensive to maintain a routine system of monitoring. 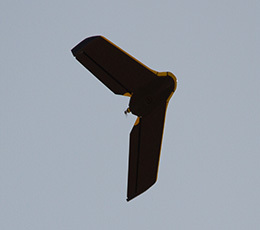 Recent years have seen the rapid emergence of low-altitude unmanned aerial vehicles (micro-UAVs) for civilian use. Micro-UAVs have clear potential use for spatial ecology studies (Anderson and Gaston 2013) and for biodiversity assessments (Getzin, Wiegand, and Schöning 2012). The long-term aims of this project are to (1) reduce the cost of rangeland, and (2) to provide a tool that nonspecialists in the region can use, thus encouraging the gathering of much better information for land management decisions. Preliminary research has been conducted using a DJI s1000 octocopter equipped with a 24MP RGB and a 3.2 MP multispectral camera, and a SenseFly eBee fixed-wing drone equipped with 12 MP RGB and multispectral cameras. Preliminary trials were conducted to identify the maximum ground sampling distance (related to drone altitude and camera resolution) required to be able to identify individual species with reasonable accuracy. Images were collected at 10 m intervals from 10 to 300m above animal and plant species. From this, trials will be conducted at selected altitudes, and species observation from resulting images will be checked for accuracy against ground-based data. At time of writing, observational data of known species taken from different altitudes has been collected, illustrating the viability of the technology. By the time of the conference presentation, results should include at least one structured study evaluating the reliability of the technology at a specific ground sampling distance. Micro-UAVs have an enormous potential for improving rangeland management in the MENA region. However, much work still needs to be done to streamline processes and evaluate the enormous amount of data produced.